As soon as he spied the Jolly Wrencher on my shirt, [Jerry Wasinger] beckoned me toward his booth at Kansas City Maker Faire. Honestly, though, I was already drawn in. [Jerry] had set up some interactive displays that demonstrate the virtues of his Pi-Plates—Raspberry Pi expansion boards that follow the HAT spec and are compatible with all flavors of Pi without following the HAT spec. Why not? Because it doesn’t allow for stacking the boards. [Jerry] has developed three types of Pi-Plates to date. There’s a relay controller with seven slots, a data acquisition and controller combo board, and a motor controller that can handle two steppers or up to four DC motors. The main image shows the data acquisition board controlling a fan and some lights while it gathers distance sensor data and takes the temperature of the Faire. The best part about these boards is that you can stack them and use up to eight of any one type. For the motor controller, that’s 16 steppers or 32 DC motors. But wait, there’s more: you can still stack up to eight each of the other two kinds of boards and put them in any order you want. That means you could run all those motors and simultaneously control several voltages or gather a lot of data points with a single Pi. The Pi-Plates are available from [Jerry]’s site, both singly and in kits that include an acrylic base plate, a proto plate, and all the hardware and standoffs needed to stack everything together. There are a lot of blinky glowy things at Burning Man every year, and [Mark] decided he would literally throw his hat into the ring. He built a high visibility top hat studded with more RGB LEDs than common sense would dictate. It’s a flashy hat, and a very good example of the fashion statement a few hundred LEDs can make. [Mark]’s top hat has 481 WS2812b addressable LEDs studded around the perimeter, a common LED choice for bright and blinky wearables. These LEDs are driven by a Teensy 3.1, with a Bluetooth transceiver, a GPS module, a compass, and gyro/accelerometer attached to the microcontroller. That’s a lot of hardware, but it gives [Mark] the capability of having the hat react to its own orientation, point itself North, and allow for control via a modified Nintendo NES controller. The WS2812 LEDs draw a lot of power, and for any wearable project having portable power is a chief concern. [Mark]’s original plan was to use an 8x battery holder for the electronics enclosure, and use five AA batteries to power the hat. The total idle draw of the LEDs was 4.5 Watts, and with even a few LEDs blinking colors there was a significant voltage drop. The idea of powering the hat with AA batteries was discarded and the power source was changed to a 195 Watt-hour lithium ion battery bank that was topped off each day with a solar panel. The hat is awesome, exceedingly bright, and something that gets a lot of attention everywhere it goes. For indoor use, it might be too bright, but this could be fixed with the addition of a bit of black stretchy fabric, like what our own [Mike Szczys] did for his DEF CON hat. [Mark]’s hat is just version 1, and he plans on making a second LED hat for next year. 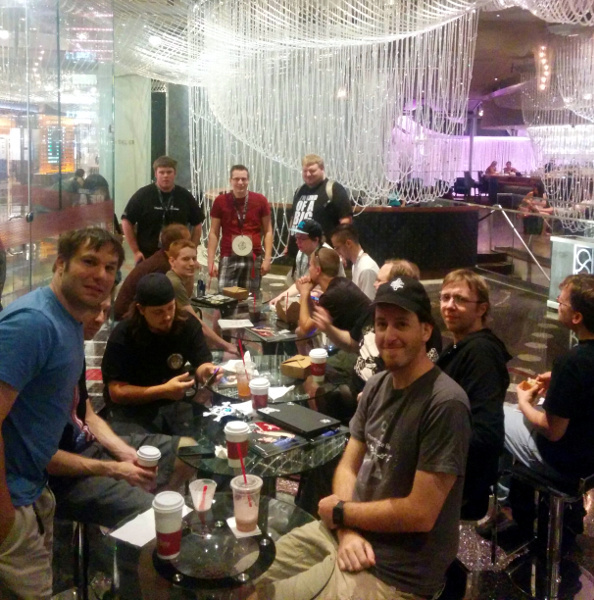 We had a wild time at DEF CON last week. Here’s a look back on everything that happened. For us, the festivities closed out with a Hackaday Breakfast Meetup on Sunday morning. Usually we’d find a bar and have people congregate in the evening but there are so many parties at this conference (official and unofficial) that we didn’t want people to have to choose between them. Instead, we made people shake off the hangover and get out of bed in time for the 10:30am event. We had a great group show up and many of them brought hardware with them. [TrueControl] spilled all the beans about the hardware and software design of this year’s Whiskey Pirate badge. This was by far my favorite unofficial badge of the conference… I made a post covering all the badges I could find over the weekend. We had about thirty people roll through and many of them stayed for two hours. A big thanks to Supplyframe, Hackaday’s parent company, for picking up the breakfast check and for making trips like this possible for the Hackaday crew. For DEF CON 22 I built a hat that scrolls messages and also serves as a simple WiFi-based crypto game. Log onto the access point and try to load any webpage and you’ll be greeted with the scoreboard shown above. Crack any of the hashes and you can log into the hat, put your name on the scoreboard, and make the hat say anything you want. Last year only one person hacked the hat, this year there were 7 names on the scoreboard for a total of 22 cracked hashes. Nice work! Three of these hackers talked to me, the other four were covert about their hat hacking. The top scorer used a shell script to automate logging-in with the cracked passwords and putting his name on the scoreboard. I’d really like to change it up next year. Perhaps three hats worn by three people who involves some type of 3-part key to add different challenges to this. If you have any ideas I’d love to hear them below, or as comments on the project page. One of the “village” talks that I really enjoyed was from [Eric Evenchick]. He’s been a writer here for a few years, but his serious engineering life is gobbling up more and more of his time — good for him! You probably remember the CANtact tool he built to bring car hacking into Open Source. Since then he’s been all over the place giving talks about it. This includes Blackhat Asia earlier in the year (here are the slides), and a talk at BlackHat a few days before DEF CON. This village talk wasn’t the same as those, instead he focused on showing what socketCAN is capable of and how you might use it in your own hacking. This is an open source software suite that is in the Linux repos. It provides a range of tools that let you listen in on CAN packets, record them, and send them out to your own car. It was great to hear [Eric] rattle off examples of when each would be useful. If you missed any of them, here’s our coverage from the conference. We had a blast and are looking forward to seeing everyone there next year! The Spark Electron was released a few days ago, giving anyone with the Arduino IDE the ability to send data out over a GSM network. Of course, the Electron is just a GSM module tied to a microcontroller, and you can do the same thing with a Pi, some components, and a bit of wire. The build is fairly basic – just an Adafruit Fona, a 2000 mah LiPo battery, a charge controller, and a fancy Hackaday Perma-Proto Hat, although a piece of perf board would work just as well in the case of the perma-proto board. Connections were as simple as power, ground, TX and RX. With a few libraries, you can access a Pi over the Internet anywhere that has cell service, or send data from the Pi without a WiFi connection. If you decide to replicate this project, be aware you have an option of soldering the Fona module right side up or upside down. The former gives you pretty blinking LEDs, while the latter allows you to access the SIM. Tough choices, indeed. [gfish] was planning on attending Burning Man and wanted to make something unique (and useful) to wear. He decided on a hat/clock hybrid. Just slapping a clock on a hat would be too easy, though. [gfish] wanted his hat to change time zones both via manual switches or physical location. On the front of the hat there are 2 hands, as most clocks have. Each one is attached to one of two concentric shafts that run to the back of the hat. Each hand is individually controlled by an RC vehicle servo. Those of you familiar with RC servos know that a servos’ max rotation is about 180 degrees and is certainly not enough for a full revolution required by the clock. To fix this, there is a 3:1 gear set that allows a 120 degree rotation of the servo to move the clock hand a full 360 degrees. With this method, each hand can’t move past 12 and instead has to quickly move counter-clockwise to get where it needs to be in order to again start its journey around the clock face. Mounted inside the hat there is an Arduino that controls the clock, a GPS shield to determine location and an RTC to maintain accurate time. Mounted on the side of the hat is a control panel that contains an overall on/off switch as well as a rotary switch for selecting a specific timezone or for engaging GPS mode. The whole thing is powered by a 9 volt battery. If you like unnecessarily complicated top hats, check out this WiFi enabled message displaying one. You probably remember that for DEFCON I built a hat that was turned into a game. In addition to scrolling messages on an LED marquee there was a WiFi router hidden inside the hat. Get on the AP, load any webpage, and you would be confronted with a scoreboard, as well as a list of usernames and their accompanying password hashes. Crack a hash and you can put yourself on the scoreboard as well as push custom messages to the hat itself. Choosing the complexity of these password hashes was quite a challenge. How do you make them hackable without being so simple that they would be immediately cracked? I suppose I did okay with this because one hacker (who prefers not to be named) caught me literally on my way out of the conference for the last time. He had snagged the hashes earlier in the weekend and worked feverishly to crack the code. More details on the process are available after the jump.